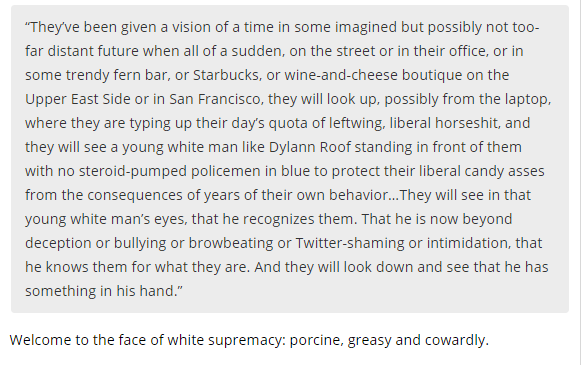 Charles Johnson, White Constitutional Lawyer & Internet Fascist, Barks Loudly. Really, Charles? Empty-headed BS? Seems you spent an inordinate amount of time attempting to squelch the free speech of others who politely disagreed with you by labeling them racists, homophobes, nazis, etc., with absolutely no evidence to support your allegations..
Amendment I – Congress shall make no law respecting an establishment of religion, or prohibiting the free exercise thereof; or abridging the freedom of speech, or of the press; or the right of the people peaceably to assemble, and to petition the government for a redress of grievances. There’s a reason you’re not in charge of Constitutional Law Interpretation, Charles. Now let’s talk about your +10 year-old “Now I Really Really Mean It” fauxvitar. Charles Johnson present vs. Charles Johnson past: Dezzez sets it up, Pakimon calls it, Gamma3 for the win. Al-Qaeda’s attacks on 9/11 happened 15 years ago. During that time span Charles went from being at the forefront of anti Jihad to being a social justice warrior. He no longer focuses on Jihadists who thankfully are killing themselves in Syria, but instead rants about Nazis. I do find the Alt Right disgusting and they deserve all the scorn in the world, but I find the various Islamic groups bad as well. 15 years after 9/11, Charles has forgotten who attacked us. The following are Charles Johnson’s own unedited comments as they appeared on Little Green Footballs, 11 September 2001. The creatures who did this were not human. Humanity is something you choose; when these things chose their course, plotted their evil, and carried it out, they relinquished the privilege of being considered human. Even more sickening are the scenes of celebration coming out of Palestine and other Islamic states. Such hate. Such joyous embracing of evil. It’s just soul-wrenching. Jeffrey just put up a note. I haven’t been able to connect to the Morning News, or to Metafilter or wholelottanothing. So what exactly fills you with “disrespect?” The idea that we know who the enemy is? Do you disagree? Or are you simply expressing the knee-jerk, unthinking European criticism of anything American that I’ve seen so many times? That’s what I think, and frankly, it’s very boring, and very ignorant. And at a time like this, very inappropriate. If you have something thoughtful to contribute I welcome it. But if you continue to equate the Israelis with the Nazis, you may get banned. Think before you write. And isn’t this the central dilemma of trying to deal with monsters like these—that they feel no similar hesitation about involving innocents? And in fact, that they deliberately target innocents? This is the horrifying reality that Israel has been dealing with; when the monsters create the rules, how can you avoid taking on some of their attributes in the battle? 10 years ago today, Charles Johnson went Scooters. How do you know, Charles? The paranoid shut in makes a huge accusation about his namesake. I suspect Charles has done this in the past. It’s a beautiful thing to be hold when the tables get turned on Charles. He has spent years accusing the Right of talking down to people. On Twitter, he gets accused of doing that very deed! Poor Charles, getting his accusations turned back at him! 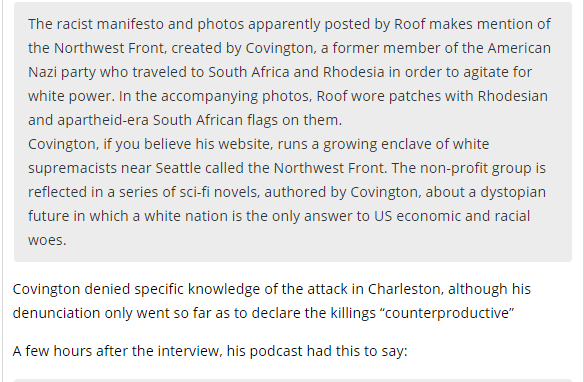 The Race Detective continues to milk the Charleston shoot committed by Neo-Nazi Dylann Roof. The online Nazi hunter on a daily basis uses the shootings to score political points. 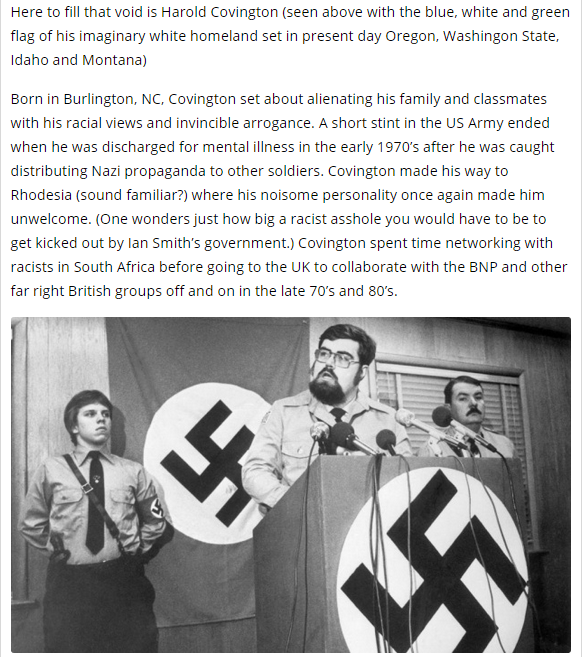 In his latest discover, the Race Detective promotes a post by celticdragon about some obscure Nazi named Harold Covington. 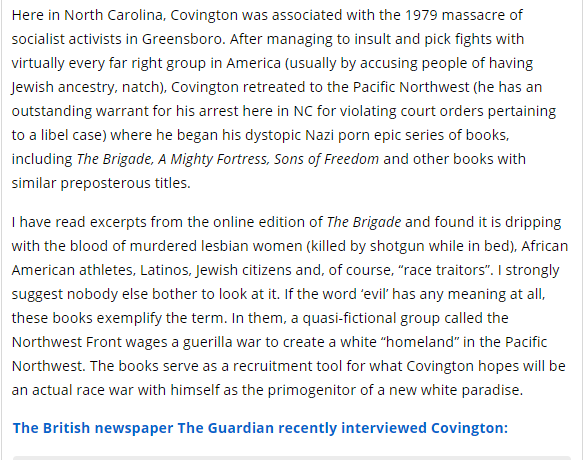 This post still does not show how any connection between Harold Covington and Dylann Roof. 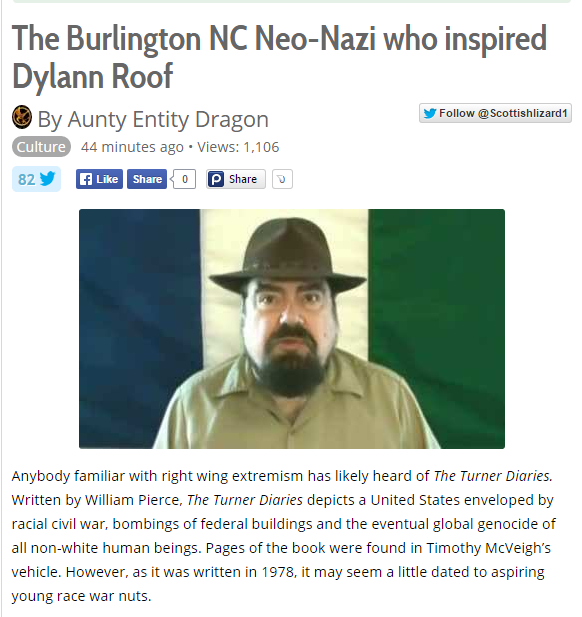 It does not matter, The Race Detective found a Nazi and is patting himself on the back.